전 대구 동화사 비로암 삼층석탑 납석사리호(傳 大邱 桐華寺 毘盧庵 三層石塔 蠟石舍利壺)는 동화사 비로암 삼층석탑(보물 제247호) 내에서 발견된 통일신라시대의 사리 항아리이다. 사리를 탑에 보관하기 위해 사용된 이 항아리는 높이 8.3㎝, 구연부 지름 8.0㎝, 밑지름 8.5㎝이다. 현재는 4개의 조각으로 깨졌고, 뚜껑도 없어졌으며 몸통도 완전하지 않은 상태이다. 이와 같은 손상은 도굴 당시에 입은 피해로 추정된다. 구연부가 넓고 어깨가 부풀어 있으며, 아랫부분이 좁은 항아리 모양으로 작고 아담하다. 이러한 형식은 법광사 삼층석탑, 취서사 삼층석탑에서 출토된 사리 항아리와 같은 것으로 9세기 중엽 신라에서 유행하던 양식이다. 항아리 표면 전체에 흑칠을 한 점이 특이하다. 어깨부분에는 꽃 구름무늬와 촘촘한 빗금 꽃무늬를 두 칸에 나누어 새겨 둘렀다. 몸통에는 가로, 세로로 칸을 내어 7자 38행의 글자를 음각하였다. 글 중에는 이 항아리가 신라 민애왕(재위 838∼839)을 위하여 건립된 석탑과 연관이 있으며,민애왕의 행적들이 꼼꼼하게 적혀있다. 또한 경문왕 3년(863)에 탑이 만들어진 것으로 기록하였다. This agalmatolite reliquary of the Unified Silla Period was discovered in the Three-story Stone Pagoda at Biroam Hermitage, Donghwasa Temple, Daegu (Treasure No. 247). The jar was used to store a sarira (relic of the Buddha or monks) inside the pagoda. It stands 8.3 cm tall and has an upper diameter of 8.0 cm and a base diameter of 8.5 cm. At present, it is broken into four pieces of different sizes; its lid is missing; and its body is in uneven condition, too. These damages seem to have been caused by grave robbers. The small and elegant jar is shaped with a wide mouth, swollen shoulder, and narrow lower portion. It was a popular design in mid-ninth century Silla, and similar jars of this type have also been found in the Three-story Stone Pagodas at Beopgwangsa and Chwiseosa Temples. Its most unique feature is its surface which is painted completely black. The shoulder area is divided into two sections, both of which are filled with repeated patterns of flower-like clouds and flowers in slanted lines. The body is divided by horizontal and vertical lines that create squares in which 38 lines of verse, each composed of seven characters, are engraved. 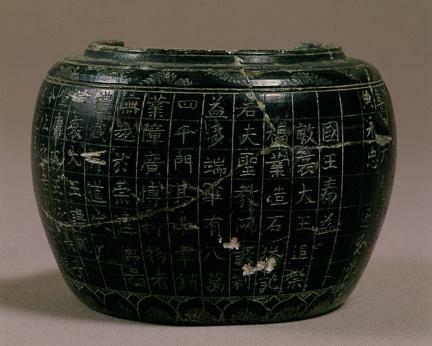 These verses indicate that the jar is related to the stone pagoda built for King Minae (r. 838-839) of the Silla Dynasty, and include a detailed record of the king’s life and the construction date of the pagoda, i.e. 863, the 3rd year of the reign of King Gyeongmun.